The Poorhouse for the parish of Tynemouth is an extensive building, pleasantly situated at a short distance north of the church. The expenditure of this house, for the year ending December, 1826, was £898 8s. 6¾d., and the average number of inmates, during the last four years, has been about 90, and their maintenance has cost their respective townships about 3s.9d. per head weekly. In the same year, South Blyth (or Blyth Nook) had a workhouse at Crofton with Brodie Adam as its governor. Backworth, Bebside, Burradon, Chirton (4), Cowpen (2), Cramlington, Cullercoates, Earsdon, East Hartford, West Hartford, Hartley (2), Holywell, Horton, Long Benton (5), Monkseaton, Murton, Newsham and South Blyth (2), Preston, Seghill, Seaton Delavel, North Shields (5), Tynemouth (7), Wallsend (4), Whitley. The population falling within the union at the 1831 census had been 47,715 with townships ranging in size from East Hartford (population 12) to Tynemouth itself (10,182). The average annual poor-rate expenditure for the period 1834-6 had been £13,140 or 5s.6d. per head of the population. New infirmary blocks were added in 1903 and 1909, followed by an operating theatre in 1913, mortuary in 1920, and receiving wards in 1925-6. Tynemouth main workhouse building from the west. In 1930, the workhouse became Tynemouth Corporation Public Assistance Institution, and subsequently Preston Hospital. 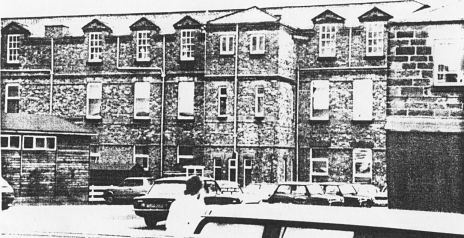 The hospital closed in the mid-1990s and the site has been completely redeveloped for housing. The Tynemouth Union established a number of scattered homes for housing pauper children. The homes were located at Earsdon, Monkseaton, and in North Shields at Park Crescent and Queen Alexandra Road. In each case there were actually two homes — one for boys and one for girls. A Receiving Home for processing new arrivals was located at Military Road, North Shields. In all, the homes provided 136 places. Tyne and Wear Archives, Discovery Museum, Blandford Square, Newcastle upon Tyne NE1 4JA. Holdings include: Guardians' minute books (1836-1931); Admissions and discharges (1867-1947); Creed registers (1884-1949); Births (1914-48); Deaths (1896-1949); Lunatics register (1911-48); etc.